As a busy mom, wife and entrepreneur I often sacrifice my personal care time to satisfy the needs of my family and business. In doing this I noticed my skin was getting dryer and my makeup was gathering dust. With much disappointment, I looked in the mirror and knew I had to make a change. I started to consolidate some of my skin care products as well as reschedule some of my beauty routine in order to make more time for me. Below are 4 tips that I use to simplify my daily routine and keep my skin healthy and glowing. Choose skin care products that can double up as both face and body care. Start in your bathroom by trying to use your natural shower gel as your facial cleanser. Do the same with your body lotions and hair conditioner. Branch out to other brands as needed. Double your hair conditioner as a shaving cream. The conditioner will soften your skin and hair making it easier for the blade to remove the hair. The results are fabulously soft and smooth legs. There are plenty of natural skin care brands that work well on both your face and body. Doing this will save you some time and money as you only need 3 products instead of 6. I use Butter Angels Body Butter for both face and body care. It's light, quick absorbing, and long lasting. Mornings are really hectic for most women. Rescheduling some of your grooming to the evening will help you save time. For example, shaving at night will not only help rejuvenate your skin, but it will also save you 5-10 minutes in the morning. Washing your hair a night can also save you a few minutes in the morning. Adding a little product to your hair and covering it with a scarf will prevent it from getting tangled. In the morning you can pop a couple of curls in and run out the door. You are beautiful and don’t need full face for regular day-to-day activities. So save yourself a few minutes in the morning by minimizing your makeup routine. Find 1 to 2 items you cannot live without and save the rest for special occasions. Your natural beauty will be enhanced, your skin will breathe, and you can use that extra 2-3 minutes to actually sit down and eat breakfast instead of dropping muffin crumbs on your lap in traffic. If you don’t know how to quickly apply makeup go to YouTube and search for “5 minute face makeup tutorial”. There are tons of videos from women (and men) of all backgrounds who successfully teach and demonstrate how to do a 5 minute face. Below are two tutorial challenges you can try, but there are tons if you want bigger selection. Choose skin care products that you can use at home and on the go. Often times we have a huge bottle or jar of lotion at home, a tiny tube in our bag, and a medium sized pump bottle at work. During a typical day you put on three different scents and creams, which may not blend well with your perfume. Simplify things by choosing a brand that is easy to use at home, small and portable for your bag and utilizes very little desk space at work. Often times I grab my moisturizer off my night stand and throw it in my bag. That way I have the same scent all day and I use it to the last drop. 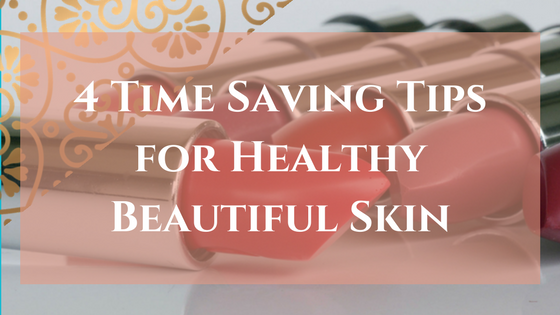 These 4 tips have helped me save time, money and headache while keeping my skin rejuvenated and fresh every day. I know they will serve you well.